(1.A) Welcome to the TAP Persia website (hereby referred to as “Website“). The terms “we“, “us“, “our” and “TAP” refer to “TAP Persia”, a travel and tourism start-up with offices in Esfahan, Iran and Berlin, Germany. The term “you” refers to customers visiting the Website and/or booking a reservation through us on this Website, or through our customer service agents.This Website is provided to assist customers in gathering travel information, determining the availability of travel-related goods and services, making legitimate reservations or otherwise transacting business with travel suppliers, and for any and all services provided under the travel and tourism umbrella. All goods and services are provided by TAP Persia through our website, mobile apps and other digital or physical channels operated by us (hereby referred to as “TAP Persia Services”). (1.B) This Website and all associated services are provided upon your acceptance, without modification or omission, of all the terms, conditions, and notices set forth below (hereby collectively referred to as the “Terms & Conditions” or “Agreement“). Please read these Terms of Conditions carefully, as they contain important information about limitations of liability and resolution of disputes through arbitration rather than in court. By accessing or using this Website, booking any reservations for travel products or services on this Website, or contacting any of worldwide representatives or agents, you agree to this Agreement in its entirety. (1.C) If you do not agree any part of these Terms & Conditions, please do not use any of our services, book any reservations through this Website or contact any of worldwide representatives or agents. (2.A.5) You will inform such other persons about the Terms & Conditions that apply to the reservations you have made on their behalf, including all rules and restrictions applicable thereto. (2.B) All information supplied by you on this Website is true, accurate, current and complete. (2.C) We retain the right, at our sole discretion, to deny access to this Website and the services we offer to anyone, at any time and for any reason, including, but not limited to, the violation of these Terms & Conditions. (3.A) TAP Persia is vigorously committed to customer satisfaction. If you have any problems or disputes regarding any one of TAP Persia Services, we try our utmost to resolve your concerns. In the even that we are unsuccessful in mitigating your concerns, after extensive communication between all affected parties, by providing similar alternatives, or in the worst case, a refund, you may pursue a written claim as explained in this section. (3.A.2) If we are not able to resolve your Claims within 60 days, you may seek relief through arbitration or in small claims court, as set forth in Article 3.B of these Terms & Conditions. (3.B) Any and all Claims will be resolved by binding arbitration, rather than in a designated court of law. (3.B.1) This includes any Claims you assert against us, our subsidiaries, travel suppliers or any companies offering products or services through us (which are beneficiaries of this arbitration agreement). (3.B.2) This also includes any Claims that arose before you accepted these Terms & Conditions, regardless of whether prior versions of the Terms & Conditions required arbitration. (3.B.3) Any and all proceedings to resolve Claims will be conducted only on an individual basis and not in a class, consolidated or representative action. (3.B.4) If your claim qualifies under the requirements of the small claims court of Iran, you may assert your claim on an individual basis. (3.B.5) If, for any reason, a Claim proceeds in the court of law rather than in arbitration, we waive any right to a jury trial. (4.A) The content and information on this Website (including, but not limited to, price and availability of all travel goods and services) as well as the infrastructure used to provide such content and information, are the proprietary property of TAP Persia, its suppliers and providers. (4.B) While you may make limited copies of your travel itinerary (and related documents) for travel or service reservations booked through this Website, you agree not to otherwise modify copy, distribute, transmit, display, perform, reproduce, publish, license, create derivative works from, transfer, or sell or re-sell any information, software, products, or services obtained from or through this Website. (4.C.7) “Frame”, “mirror” or otherwise incorporate any part of this Website into any other website without our prior written authorization. (4.D) If your booking or account shows signs of fraud, abuse or suspicious activity, TAP Persia may cancel any travel or service reservations associated with your name, email address or account, and close any associated TAP Persia accounts. (4.D.1) If you have conducted any fraudulent activity, TAP Persia reserves the right to take any necessary legal action and you may be liable for monetary losses towards TAP Persia, including litigation costs and damages. (4.D.2) To contest the cancellation of a booking or freezing or closure of an account, please contact TAP Persia Customer Service at our info@tappersia.com email. (5.A) Additional terms and conditions will apply to your reservation and purchase of selected travel-related goods and services. Please read these additional terms and conditions carefully. In particular, if you have purchased an airfare, please ensure you read the full terms and conditions of carriage issued by the Supplier, which can be found on the Supplier’s website. (5.B) You agree to abide by the terms and conditions of purchase imposed by any supplier with whom you elect to deal, including, but not limited to, payment of all amounts when due, and compliance with the supplier’s rules and restrictions regarding availability and use of fares, products, or services. (5.C) Airfare is only guaranteed once the purchase has been completed and the tickets have been issued. (5.C.1) Airlines and other travel suppliers may change their prices without notice. (5.C.2) We reserve the right to cancel your booking if full payment is not received in a timely fashion. (5.C.3) TAP Persia may offer Customers the opportunity to book a reservation for a combination of two one-way tickets instead of a round trip ticket. Combined one-way tickets may provide a greater choice of flights, are often cheaper and can be combined on the same airline or on different airlines. (5.C.4) Unlike round trip tickets, each one-way ticket is subject to its own rules, restrictions, and fees. (5.C.5) If one of these flights is affected by an airline change (e.g. cancellation or rescheduling) that causes a Customer to make changes to the other flight, the Customer will be responsible for any fees incurred for making changes to the unaffected flight. (6.A) Some banks and credit card companies impose fees for international transactions. This means the amount listed on your credit or bank card statement may be in your local currency and may be a different figure than the figure shown on the billing summary page for a reservation booked on the Website. (6.B) The currency exchange rate and foreign transaction fee is determined solely by your bank on the day that they process the transaction. If you have any questions about these fees or the exchange rate applied to your booking, please contact your bank. (7.A) You are responsible for ensuring that you meet Iran’s entry requirements and that your travel documents, such as passports and visas (transit, business, tourist, and otherwise), are in order and any other Iran entry requirements are met. We urge customers to review travel prohibitions, warnings, announcements, and advisories issued by the relevant governments prior to booking travel to Iran. (7.B) We accept no liability if you are refused entry onto a flight or into any country due to your failure to carry the correct and adequate passport, visa, or other travel documents required by any airline, authority, or country, including countries you may just be transiting through. This includes all stops made by the aircraft, even if you do not leave the aircraft or airport. (7.C.2) Check the requirements of each embassy or consulate, and insure that you have the more up-to-date information before booking and departure. (7.D) Recommended inoculations for travel may change and you should consult your doctor for current recommendations before you depart. It is your responsibility to ensure that you meet all health entry requirements, obtain the recommended inoculations, take all recommended medication, and follow all medical advice in relation to your trip. (8.A.3) Any (personal) injury, death, property damage, or other (direct, indirect, special, consequential or punitive) damages, losses or costs suffered, incurred or paid by you, whether due to (legal) acts, errors, breaches, (gross) negligence, willful misconduct, omissions, non-performance, misrepresentations, tort or strict liability by or (wholly or partly) attributable to the accommodation or any of our other business partners (including any of their employees, directors, officers, agents, representatives or affiliated companies) whose products or service are (directly or indirectly) made available, offered or promoted on or through the website, including any (partial) cancellation, overbooking, strike, force majeure or any other event beyond our control. (8.A.4) Any additional expenses,, delays, re-routing or acts of any government or authority. (8.B.3) Any event otherwise arising out of the access to, display of or use of this Website) whether based on a theory of negligence, contract, tort, strict liability, consumer protection statutes, or otherwise. (8.C) All such information, software products, and services are provided “as is” without warranty of any kind. (8.C.1) TAP Persia hereby disclaims all warranties and conditions with regard to the information, software, products and services on the Website, including all implied warranties and conditions of merchantability, fitness for a particular response, title and non-infringement. (8.C.2) The Information, Software, Products and Services published on this Website may include inaccuracies or errors, including pricing errors. (8.C.3) TAP Persia does not guarantee the accuracy of, and disclaim all liability for any errors or other inaccuracies relating to the information and description of the hotel, air, cruise, car and other travel products and services displayed on this Website (including, without limitation, the pricing, photographs, list of hotel amenities, general product descriptions, etc.). (8.D) TAP Persia and their respective suppliers make no guarantees about the availability of specific products and services. (8.E) TAP Persia and their respective suppliers may make improvements and/or changes on the Website at any time. (8.F) TAP Persia and their respective suppliers accept no representations regarding the suitability of the information, software, products and services contained on this Website for any purpose. (8.F.1) The inclusion or offering of any products or services on this Website does not constitute any endorsement or recommendation of such products or services by Apochi. (8.G) The carriers, hotels and other suppliers providing travel or other services on this Website are independent contractors and not agents or employees of Apochi. (8.G.1) Apochi is not liable for the acts, errors, omissions, representations, warranties, breaches or negligence of any such suppliers or for any personal injuries, death, property damage, or other damages or expenses resulting there from. (8.H.2) One-Hundred EUR (€100.00) or the equivalent in local currency. (8.J) even if TAP Persia has been advised of the possibility of such damages. (9.A.3) your use of this Website. (10.A.2) Use the name that you submit in connection with such Submission. (10.B) You acknowledge that TAP Persia may choose to provide attribution of your comments or reviews (for example, listing your name and hometown on a hotel review that you submit) at our discretion, and that such submissions may be shared with our supplier partners. (10.B.1) We have no obligation to post your comments; we reserve the right in our absolute discretion to determine which comments are published on the Website. (10.D) You acknowledge and agree that Submissions are non-confidential and non-proprietary. (10.E) You expressly waive any and all ‘moral rights’ (including rights of attribution or integrity) that may subsist in your Submissions and agree that you have no objection to the publication, use, modification, deletion or exploitation of your Submissions by us, TAP Persia, or any of our partners or licensees. (10.F) We take no responsibility and assume no liability for any Submissions posted or submitted by you. (10.G.3) Any material or content that infringes, misappropriates or violates any copyright, trademark, patent right or other proprietary right of the Company or any third party. (10.H) You shall be solely liable for any damages resulting from any violation of the foregoing restrictions, or any other harm resulting from your posting of content to this Website. You acknowledge that TAP Persia may exercise its rights (e.g. use, publish, delete) to any content you submit without notice to you. (10.I) If you submit more than one review for the same hotel, flight or bus, only your most recent submission is eligible for use. (10.J.1) As it is important to us that hotel reviews are impartial and honest, these incentives will be available to customers regardless of whether the hotel review is positive or negative. (10.K) TAP Persia claims no ownership, affiliation with, or endorsement of any photos that are submitted by end users through our sites. TAP Persia’s policies with respect to claims by third parties that the content of the Website, including the content of any Submissions, infringes the copyrights owned by said third party can be found in the Article 11: Notice of Infringing Material. (10.L) The Google® Translate tool is made available on this Website to enable you to translate content such as user-generated hotel reviews. The Google® Translate tool uses an automated process to translate text and this may result in inaccuracies. (10.L.1) Your use of the Google® Translate tool is entirely at your own risk. TAP Persia does not warrant or make any promises, assurances or guarantees as to the accuracy or completeness of the translations provided by Google® Translate. (10.M) Fictitious names of companies, products, people, characters, and/or data mentioned on this Website are not intended to represent any real individual, company, product, or event. (10.N) Any rights not expressly granted herein are reserved. (11.A.1) A clear identification of the copyrighted work you claim was infringed. (11.A.2) A clear identification of the material you claim is infringing on the Website, along with a link to the infringing material. (11.A.3) Your address, email address and telephone number. (11.A.6) A signature by the person authorized to act on behalf of the owner of an exclusive right that is allegedly infringed. (11.B) You may send us your notice by email to info@tappersia.com. (12.A) Bookings made using promotional codes or offers are not subject to a cash refund, regardless of notice. We can negotiable an equivalent exchange, not including any additional incurred costs. (12.B) If you show up more than 1 hour late for your tour or activity without coordinating with us or your local guide, your tour will be cancelled and cannot be rescheduled. (12.C) We are not responsible for uncontrollable circumstances and do not make exceptions for last minute cancellations. If you feel like a true emergency caused cancellations in your plans, please contact our customer support department. (12.E) The currency converter provided on our site should not be relied on to calculate your refund accurately and in real time. Conversion rates of the Iranian Rial vary daily. (12.F) Obvious errors and mistakes (including misprints) in the terms and conditions, cancellations policy or other fine print of any of TAP Persia’s products and services are not binding. (12.G.1) Accommodations may include hotels, hostels, ecolodges, guest houses, home stays, camps and any other conditions in which the traveller is provided with a place to sleep and spend the night. (12.G.2) Hotel cancellation policies depend on the individual hotel for the particular night or nights the traveller chose to occupy the hotel room. (12.G.3) Prices individual cancellation policies depend on the travel season and demand. (12.G.4) Special offers including discounts and promotions often carry special restrictions and conditions, specifically regarding cancellations and refunds. Please check the room and rate details thoroughly prior to making your reservation. (12.G.5.a) If you let us know of the cancellation more than 30 days prior to your reservation, we can provide you with either a 50% cash refund or a 100% equivalent selection. If you happen to make a selection that was more expensive than your previous hotel, you are responsible for the difference in price. (12.G.5.b) If you let us know of the cancellation less than 30 days prior to your reservation, there are no refunds of any kind available. (12.G.6.a) If you let us know about the cancellation more than 14 days prior to your reservation, we can provide you with either a 85% cash refund (delivered within 2 weeks) or a 100% equivalent selection. (12.G.6.b) If you let us know about the cancellation between 7 – 14 days prior to your reservation, we can provide you with either a 50% cash refund (delivered within 2 weeks) or a negotiable equivalent exchange, not including any additional incurred costs. (12.G.6.c) If you let us know about the cancellation less than 7 days prior to your reservation, there are no cash refunds available, but we can negotiate on an equivalent exchange, not including any additional incurred costs. (12.H.1) There are no refunds or equivalent exchanges available for flights of any kind, including but not limited to chartered flights and airline flights. (12.I.1) If you let us know about the cancellation more than 7 days prior to your ticket date, we can provide you with either a 85% cash refund (delivered within 2 weeks). (12.I.2) If you let us know about the cancellation between 2 – 7 days prior to your reservation, we can provide you with either a 50% cash refund (delivered within 2 weeks). (12.I.3) If you let us know about the cancellation less than 48 hours prior to your reservation, there are no refunds of any kind available. (12.J.1) If you let us know about the cancellation more than 7 days prior to your ticket date, we can provide you with either a 50% cash refund (delivered within 2 weeks). (12.J.2) If you let us know about the cancellation less than 7 days prior to your reservation, there are no refunds of any kind available. (12.K.1) Private or chartered vehicles are any form of automotive transportation used to transport single or groups of travellers, and include, but are not limited to sedans, vans, trucks, minibuses & buses. (12.K.2) If you let us know about the cancellation more than 7 days prior to your ticket date, we can provide you with either an 80% cash refund (delivered within 2 weeks) or a 100% equivalent selection. (12.K.3) If you let us know about the cancellation between 2 – 7 days prior to your reservation, we can provide you with either a 50% cash refund (delivered within 2 weeks) or a 100% equivalent selection. (12.K.4) If you let us know about the cancellation less than 48 hours prior to your reservation, there are no cash refunds, but we can provide a 100% equivalent selection. (12.L.1) Tours activities are services in the forms of travel programs, ranging from 3 hours to 30 days, reserved for one or more travellers in a variety of indoor and outdoor settings. (12.L.2) If you let us know about the cancellation more than 14 days prior to your ticket date, we can provide you with either a 85% cash refund (delivered within 2 weeks). (12.L.3) If you let us know about the cancellation between 7 – 14 days prior to your reservation, we can provide you with either a 50% cash refund (delivered within 2 weeks). (12.L.4) If you let us know about the cancellation less than 7 days prior to your reservation, there are no cash refunds, but we can negotiate on an equivalent exchange, not including any additional incurred costs. (12.M.1) Products are any physical item we sell on the TAP Persia website, including but not limited to tourist cards, postcards & Keshmoon saffron. (12.M.2) If you let us know about the cancellation prior to the shipment of the product, we can give you a 100% cash refund on your purchase. (12.M.2.a) Products are typically shipped 1 -7 days after the placement of an order. (12.N.1) If you let us know about the cancellation less than 14 days prior to your rental pick up, your deposit is nonrefundable. We can return any funds given along with the deposit amount. (12.O.1) The Visa Application Fee, payable upon the completion of the online visa application, is non-refundable regardless of any prior notice or the acceptance/rejection of the visa application by the Iranian Ministry of Foreign Affairs. We try our utmost to make sure each application is accepted, but we are not responsible for extraordinary conditions regarding the status of your visa. (12.P.1) The travel insurance application fee, payable upon the completion of the online travel insurance application, is non-refundable regardless of any prior notice. (13.A) The typical wait time for your visa application to arrive is typically 3 working days. (13.A.1) Thursdays and fridays are weekend days and do not count towards the wait time of the visa. (13.A.2) Visa applications take longer in the month of March due to the Iranian new year, Nowruz. 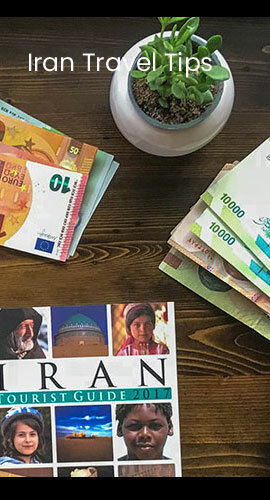 (13.B.1) Used as a processing fee by TAP Persia, which in turn provides travellers with an Iran Tourist Visa authorization code, not the Iran Tourist Visa itself. Travellers need to pick up their Iran Tourist Visa in the Iranian embassy or consulate written on your online visa application, or at the VOA counter of IKIA airport in Tehran. (13.B.2) For each individual person (single-entry visa). (13.B.3) The same for adults, children and infants. (13.B.4) Different from the Visa Entrance Fee (Visa Stamping Fee) which Iranian officials at the embassy, consulate or VOA counter charge for each individual person depending on their nationality. (13.B.5) Non-refundable, non-transferable and, in the case of a rejection, TAP Persia will not be responsible for any decision made by Iranian Ministry of Foreign Affairs. (13.C) Israeli passport holders, anyone with an Israeli stamp in their passport will not be eligible for a visa. (13.C.1) Those with exit stamps at relevant Jordanian or Egyptian border crossings into Israel will also be rejected. (13.D) Citizens of the US, UK & Canada require a more intensive and costly visa process and will be charged accordingly. (14.A) Some banks and credit card companies impose fees for international transactions. If you are making a booking from outside of the Europe, your bank may convert the payment amount to your local currency and charge you a conversion fee. (14.B) This means the amount listed on your credit or bank card statement may be in your local currency and therefore a different figure than the figure shown on the billing summary page for a reservation booked on the Website. (14.C) In addition, a foreign transaction fee may be assessed if the bank that issued your credit card is located outside of Europe. (14.D) The currency exchange rate and the foreign transaction fee is determined solely by your bank on the day that they process the transaction. (15.A.1) It is up to you to take precautions to ensure that whatever links you select or software you download (whether from this Website or other websites) is free of such items as viruses, worms, trojan horses, defects and other items of a destructive nature. (15.B) Hyperlinks to third-party websites do not imply any endorsement of the material on said site, or any associations that site may have with its operators, sponsors or owners. (16.A) Please note that all Software, including, without limitation, all HTML code and Active X controls contained on this Website, is owned by the TAP Persia, its Affiliates and/or our respective suppliers, and is protected by copyright laws and international treaty provisions. (16.B) Any reproduction or redistribution of the Software is expressly prohibited, and may result in severe civil and criminal penalties. Violators will be prosecuted to the maximum extent possible. (16.C) WITHOUT LIMITING THE FOREGOING, COPYING OR REPRODUCTION OF THE SOFTWARE TO ANY OTHER SERVER OR LOCATION FOR FURTHER REPRODUCTION OR REDISTRIBUTION IS EXPRESSLY PROHIBITED. THE SOFTWARE IS WARRANTED, IF AT ALL, ONLY ACCORDING TO THE TERMS OF THE LICENSE AGREEMENT. (16.D) You are responsible for making all arrangements necessary for your device to have internet connectivity and are responsible for all sums your service provider may charge you arising out of the Mobile Application transmitting and receiving data (including but not limited to data roaming charges).